What’s So Cool About Smart HVAC Systems? 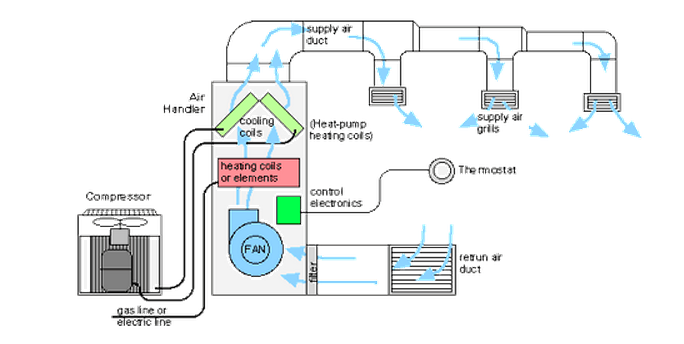 The components of Heating, Ventilating, and Air Conditioning (HVAC) have existed since the late 1800s, but it wasn’t until the 1980s that the American Society of Heating, Refrigerating, and Air-Conditioning Engineers (ASHRAE) set new standards for the minimum energy efficiency of building designs (Standards 90.1 and 90.2).These standards are considered to be major milestones in the history of HVACs, and they have helped pave the way for the future: smart HVAC systems. Building occupants and owners don’t want to waste time fiddling with the heat or air conditioning, so smart HVAC systems “learn” where and how much heat or air to bring to each section of the building. Building owners and corporations waste a great deal of money on inefficient, ineffective HVACs. Systems with smart sensors, both in the building and in the units themselves, can comprehensively monitor external sources and interior functionality so the system can maintain its efficiency. This article will explore the most critical functions of a smart HVAC system and the steps you should take if you’re interested in implementing one. Choose the HVAC and building envelope elements that can be improved once you’ve identified how the building operates. This varies dramatically from building to building, but there are a few important elements that take a simple system and make it much more intelligent. They are outlined below. While not all elements of a heating and cooling system can be made intelligent, the following alterations can take a simple system and make it energy efficient and smart. The compressor, which is the electric pump that compresses refrigerant, and the air handler, which blows air over the heating or cooling coils, both take a major energy load on the system. It’s important that these components are optimized so they don’t become a major energy (and cash) drain. Efficiency can be achieved both in the equipment itself, as well as when these two components run only when they’re needed. Many utilities also offer “demand response” programs, where utility companies will incentivize the customer to allow them to shut off big energy loads at peak demand times. Over time, the IoT will enable “time-of-use pricing”, meaning consumers will purchase energy through market mechanisms (supply and demand) rather than have fixed prices.The emergence of more distributed energy generation (like solar, wind, and battery storage) is only possible as more and more intelligence is built into our electrical grids and mechanical equipment. The ventilation system directs air where and when it’s needed in a building. In a new commercial buildings, complex ventilation systems are usually modeled beforehand with BIM technology. Even in residential construction, a licensed mechanical, engineering, and plumbing (MEP) engineer typically needs to design the HVAC system, which includes ventilation design. The overall goal is to provide air to rooms that are occupied and to keep the temperature in those rooms at a comfortable level. However, even a smart system can sometimes be overridden by building occupants, which disturbs efficiency and cost savings. Imagine a janitor, for example, who cleans a building at night. If the building has been modeled to go from 76 degrees to 85 degrees after 6 p.m., and the janitor overrides this functionality by turning the thermostat to 70 degrees each evening as he works, that’s a clear and definite misuse of the modeled system. Monitoring something like this is fairly straightforward, but what is harder is knowing if vents are blocked or people have made other “improvement” to their workspaces. The best way to monitor usage like this is through sensor-driven technology. It allows the building manager (or a computer, if the system is smart enough) to monitor when something is blocked or tampered with so the problem can get fixed right away. Smart thermostats typically measure temperature, but really smart thermostats can read temperature, humidity, occupancy, and other variable. These features allow the thermostat to make better decisions about how to adjust room temperature and setbacks. Part of the reason it is wise to bring in an auditor is that room discomfort may have little to do with temperature, and everything to do with latent heat, which is the heat caused by humidity. This may be due to air infiltration or poor HVAC design. Another part of making a thermostat smart is putting it in the right place. If a thermostat is installed near a six-burner stove in a restaurant kitchen, and the chef decides he’s too hot, the entire restaurant will freeze while he is comfortable. This is where zoning comes in. Zoned heating and cooling helps you move air to the right areas at the right time, and it is an integral part of making an HVAC system intelligent. The goal of smart HVAC is to have a system that knows what’s going on in a building, keeps everything properly cooled, saves money, and mitigates any issues associated with misuse. While everyone is familiar with buildings, they often underestimate just how complex of systems they are. Smart HVAC systems can help reduce some of this complexity for the occupants and operators. By offloading a little bit of the complexity to smart HVAC systems, you’re well on your way to creating a better environment for the people who occupy your building. Before starting Link Labs, Brian led a team at the Johns Hopkins University Applied Physics Lab that solved communications and geolocation problems for the national intelligence community. He was also the VP of Engineering at the network security company, Lookingglass, and served for eight years as a submarine officer in the U.S. Navy. He graduated from the U.S. Naval Academy and received his Master’s Degree from Oxford University.